Due to limited seating, you will need to reserve a place for the workshops. Click here. This workshop aims to equip teachers with the necessary skills to integrate e-learning into regular classroom teaching and to design e-learning courseware on their own. It is hoped that teachers will then be able to develop effective e-learning tools. The workshop will present examples of e-learning courseware in Chinese, English and Mathematics, the three major subjects in senior primary and junior secondary schools. The relevant concepts and content for these subjects will be clearly presented using multimedia, with interactive exercises to provide stimulation and enhance learning outcomes. Courseware also makes use of interactive learning activities which provide immediate feedback to students to enable them to monitor their own progress. This workshop will feature some technologies being used at university campuses for instruction. It will include a demonstration of how lessons done on an interactive whiteboard can easily be converted into various formats for posting to a blog site, on a VLE (such as WebCT or Moodle) for student access, or by email to absent students. Applications of additional Web 2.0 technologies will also be demonstrated, such as a solution for making podcasting as intuitive on the Windows platform as Garage Band makes it on the Macintosh platform. The Qwizdom hand-held voting consoles which are being used in universities in the US and the UK to quickly and easily collect student feedback will also be demonstrated. Collection of such rich data on the fly makes assessment for learning a real possibility. 'Braincellz' is a personalised assessment for learning interface being developed at Greensward College for their new Opening Minds curriculum. The concept has three components: a PDA used by the teacher to input assessment decisions; a single laptop in the classroom that each student uses to record their own perception of their learning; and a dynamic, flash driven webpage for each student which tracks their progress, targets, credits, and the decisions made by the teacher. The personalised webpage allows students and parents to monitor progress for every lesson, at any point in time. It also shows how the student is progressing against any pre-set targets. It is aimed specifically at students aged 10-14 and therefore takes on the appearance of a computer game and can be customised using a variety of themed 'skins'. Although the concept is being developed for the Opening Minds curriculum at Greensward, it could be adopted by any educational institution to engage younger students in their own learning. Scenario-based e-learning (SBL) is designed to help learners experience content through simulated real-life situations using computers and the Internet. 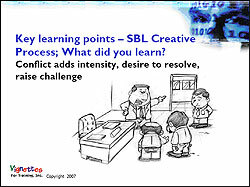 SBL helps learners to learn in areas involving judgment, emotion, behavior and decision-making. The key to creating highly engaging, immersive and effective SBL is to appeal to the primal and emotional instincts of learners. In addition, learners really only learn through stories, because stories bring content into a real-life context. So, in the case of SBL, emotionally charged stories are used which provide learners with opportunities to make decisions, and learn from the consequences of those decisions. We can say that in SBL, content is embedded in stories for learners to discover, rather than being taught or spoon fed to them. It is introduced through the stories characters, events, scenes, conflicts and resolutions. SBL becomes particularly engaging when learners are confronted with a conflict that they must resolve, and this is what keeps the story alive and pushes learners to continuously search for options, answers and alternatives. Some of the techniques used in developing SBL involve identifying characters that can represent content, selecting emotionally charged situations, establishing conversation between characters, introducing conflict through questions and events, and providing feedback such that consequences either encourage learners to make desirable decisions or discourage them from making undesirable ones. SBL is a valuable learning tool that does not have to be expensive. 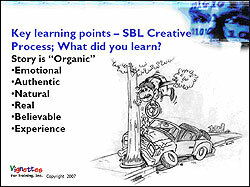 There are only three types of content which a developer and subject matter experts (SMEs) must teach using SBL: content that if misunderstood could result in great risk or a threat to life; content that if misunderstood could cause constant errors; and content that learners must master in order to perform well on the job and be successful. This workshop will introduce students to the world of Shakespeare by using the software Kar2ouche. Kar2ouche allows users to interact with Shakespeares work by writing their own scripts, designing sets, posing characters, etc. In this workshop, students will perform their scripts and present their animation projects. English Builder is a two-level English e-learning platform which aims at enhancing students vocabulary, and speaking and listening comprehension. English4Us allows users to learn English in a more flexible and active way. Members of english4us.com can evaluate their language ability through doing grammar exercises, playing games, posting essays, etc. There is a learning revolution taking place as a result of the rapid development of Web 2.0 technologies and social software. The English Schools Foundation Learning Platform or Connected Learning Community (CLC) is just one example. Its a student-led revolution in which students are creating new content, sharing new ideas and adding to each others knowledge. Imagine if we were able to enable the levels of participation that young people demonstrate in their blogs, MySpace, GarageBand, Bebo, Facebook, etc. For the ESF learner this is happening now, and it is transforming the educational landscape in our classrooms. In the workshop you will be able to see examples of how our students and staff are using the CLC learning platform with Web 2.0 applications (such as Zoho, Flickr, RSS, Slideroll and Furl) to create new ways of learning and new ways of working together. You will also be given a guest account so that you can explore for yourselves. constructed by learning communities working together and with adults in the community. Do learning and schooling mean the same thing? Can knowledge and expertise reside solely within schools and classrooms? How do we build systems that enable people to help themselves rather than do things for them? How do we ensure that managed learning environments are more than digital repositories? How do we lead and manage learning when students can access their learning anywhere, anytime? Participation in virtual networks is not necessarily productive, and the dangers are already evident. Join in discussion about the need to establish a new approach to information literacy, in which students learn how to join and build networks, learn the new protocols and learn how to use networking tools. The workshop presenters and their students have been conducting longitudinal WiFi survey experiments since 2002. The study has led to the development of various teaching materials; set world records and enriched students learning; and greatly enhanced student participants interest in relevant ICT technologies. In this workshop, participants will learn how to design, develop and carry out a typical WiFi survey experiment. The simple experiment can be conducted indoors or outdoors, inside or outside schools or as part of a field-trip experiment. Key topics covered: (1) Basic concepts of WiFi technology and applications; (2) Understanding the WiFi survey experiment; (3) Using WiFi Tools: Netstumbler, AirSnare, GPS system; (4) Acquiring WiFi air data and analysis; (5) Summary of the educational value of the experiment. Experience how digital technology can enrich your current chalk and talk teaching. Traditional and simplified Chinese handwriting recognition directly on the board is now possible! Learn how to bridge the gap between projector-screen-based ICT and chalk-and-talk/board teaching. Directly integrate electronic content, such as webpages and PowerPoint, into your day-to-day chalk-and-board teaching time. Discover different ways of re-purposing your existing teaching materials (student books, worksheets, electronic materials from book publishers) to make your daily lessons attention grabbing, interactive and multimedia rich. Find out how to get the most out of new electronic teaching objects/tools such as spyglass, multiple layers, magic tunnel, interactive protractor, compass, count down timer, etc., through interactive whiteboard technology. Decide for yourself if the level of classroom automation and efficiency brought about by the Promethean Activboard is what you have always been longing for. This workshop aims to expose participants to the use of Smart Boards and SRSs in classroom instruction and share experience in how these new technologies help arouse students interest, promote teaching and learning effectiveness, as well as facilitate studentteacher and student­student interaction. Through students demonstration of Smart Boards and an SRS, and teachers sharing, participants will get a taste of the pleasures of learning with these technologies. Their installation and set-up will also be discussed. The worldwide e-learning market is poised for exponential growth. Educators around the globe are seeking solutions for the delivery of online lectures and tutorials. The key objectives are to engage students in a real-time interactive learning mode with the ability to solicit students feedback instantaneously during the session. Lecture materials and/or computer applications can be shared and annotated in real time to increase the sense of participation while taking part in an online lecture. Workshop participants will be familiarized with the key features of such a multi-location videoconference and collaboration system and how it can be applied in an educational context. You will be able to access the system individually to gain hands-on experience in operating the system within a small-group interactive environment. The session will end with a question-and-answer period addressing any concerns or queries. This workshop will mainly feature the combination of an affordable interactive whiteboard and some WiFi tablets, which can bring learning to life in primary and secondary schools in Hong Kong. Rather than just the usual software that is used to create lessons on boards, this workshop will show participants applications that are used on electronic whiteboards in many parts of the world to engage, involve and inspire students to learn. This will include software for all subject areas, including English and Mathematics. A training programme for interactive technology, especially interactive whiteboards with sample lessons in all of the leading IWB software, video case studies, teacher worksheets, etc., will also be available for review. This session will be of great value to Principals, Heads of IT, subject specialists and any other teachers interested in enhancing the learning of their students through the use of information and communication technologies. This workshop will focus on how pupils and teachers make use of online databases (e.g., WISE News) in inquiry-based learning. The basis of the workshop is the attempt to assess one schools P.4 students familiarity with (and their perceived importance of) various databases/sources over time. This will help the school in question and other schools to develop appropriate training to help P.4 students to search for information sources for use in inquiry-based projects. It will also help schools to decide whether they should subscribe to certain databases. The workshop will begin with an introduction to the topic, followed by discussion.